Cats have a tendency to vomit occasionally. As a feline parent, it can be difficult to determine when to worry. This is where it is ideal to be knowledgeable about cat vomiting and the different reasons. Occasional vomiting can be due to many reasons. For instance, when a cat kills a rat or a bird, she gobbles it down quickly to prevent other cats from stealing it. She digests what she can and vomits indigestible like skin or feathers. While this is normal, continuous vomiting and lethargy might point to serious health concerns. Let us skim through some of the reasons worth worrying related to cat vomiting. Food allergy or intolerance can be one of the common reasons for cat vomiting. Food allergy or a sensitive digestive system can induce vomiting in cats. The immune system can develop allergy to certain foods. When the allergens enters the cats stomach, the immune system reacts, which causes inflammation of the gut lining. This can also lead to diarrhea or some other stomach infections. All of these can increase the probability of vomiting in cats. Infections mainly bacterial and viral can cause vomiting in felines. Cats that are not vaccinated have a higher probability of getting infected with virus and bacteria. Therefore, if your cat is not vaccinated and if you see the signs of lethargy, lack of interest in food accompanied by vomiting. It can be due to viral and bacterial infections. 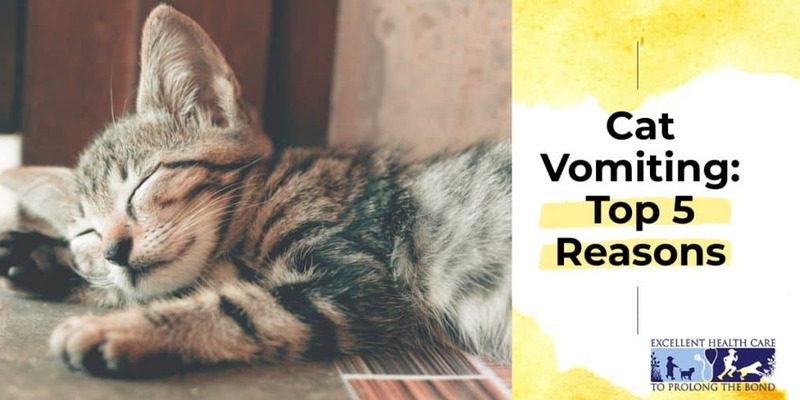 Health concerns to the bowel, mainly in the form of inflammations known as inflammatory bowel disease or IBD can be another reason that can cause vomiting in cats. Food allergy, stress or pre cancerous changes are the common cause of inflammatory bowel disease. Under such a circumstance, the felines develop allergy to most of the food items and their gut lining is affected by inflammations. This is something that can induce diarrhea accompanied with vomiting. Metabolic rate of cats are regulated by the hormones produced from thyroid glands. However, thyroid glands in some cats produce hormones in excess. This leads to overstimulation in the cat’s body as well as the gut, which causes vomiting and other symptoms. Other symptoms of this condition include hyperactive, abnormal hunger and weight loss. Pancreatitis is a serious concern that can cause vomiting in cats. As in human beings, pancreas in cats also produces digestive juices. On some occasions, the pouch holding the pancreatic juice overflows. The condition leads to the digestion of pancreas itself in addition to the surrounding soft tissue. This causes sickness in cats and the major symptoms include vomiting and lethargy. Always keep a close eye on your cat once, you see observe him vomiting. You should consider taking her to a veterinarian once you start observing any of the following. Communicate with your veterinarian and let him know the exact symptoms so that he can provide the right treatment plan for your cat.